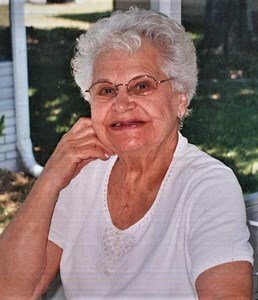 Dorris E. Paddock, 96, died March 30. Those who knew “Dorrie” will remember her lovely smile. She was active as one of Jehovah’s Witnesses. In her younger years she found great joy in sharing the Bible’s message of a new world of righteousness soon to replace the suffering and woes we see today. She is predeceased by her daughter, Darlene Reissig; and a son, Scott Paddock. She is survived by sons, Gary Paddock, Wayne (Teresa) Paddock; daughter, Suzanne (Tom) Ripley; a nephew, Steve Mantle; a niece Kathy; and several grandchildren. Add your memories to the guest book of Dorris Paddock. Dorrie was a wonderful person, always smiling. I really enjoyed taking her on her return visits to interested ones. It was fun including her on some of our trips we took with my husband and Mom. Now she is in Jehovah’s memory and we look forward to seeing her in the near future. My thoughts and prayers are with you Wayne and Terry and to all the familyi extend my sympathy.